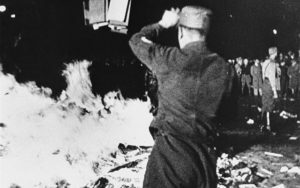 LONDON — Among the 25,000 books consumed by the flames in Berlin’s Opernplatz on May 10, 1933 were those of Alfred Kerr. They had also earned him the emnity of the Nazis; a hostility which the socialist writer heartily returned. Given the fate to which Josef Goebbels consigned Kerr’s books, it is perhaps fitting that his daughter — who turned 95 on June 14 and is still going strong — is now one of Britain’s best-loved children’s authors and illustrators. This year marks the 50th anniversary of the publication of Judith Kerr’s first book, “The Tiger Who Came To Tea.” It was an instant classic, remains in print and is one of the best-selling children’s books of all time. Its premise – an uninvited tiger turns up at a child’s home, and eats and drinks everything, including her father’s beer and, most famously, “all the water in the tap” – is both simple and surreal. With its accompanying sketches by Kerr, it has charmed and delighted both children and adults for half a century. Ten years ago, “The Tiger Who Came To Tea” was turned into a stage play, which has been revived to mark the anniversary and is about to begin a run in London’s West End on June 28 before commencing a nationwide UK tour. Together, Kerr’s 30-plus books have notched up 10 million sales and been translated into 20 languages. Alongside “The Tiger Who Came To Tea,” Kerr’s fictional cat, Mog, who features in 17 of her picture books, is equally beloved. That the series – whose feline lead character was inspired by her own cat – spanned three decades is further testament to the enduring appeal of Kerr’s writing and drawing. Alfred fled Germany for Prague following a tip-off from a friendly policeman that his passport was about to be seized by the Nazis. He had long been in their sights. Kerr would subsequently find out that her father was driven to his weekly radio broadcast in a car accompanied by an armed guard. Several weeks later, on the night before the general election of March 5, 1933 which consolidated Hitler’s grip on power, Judith, her mother, and brother, Michael, caught the train to Switzerland. At the frontier, 9-year-old Judith, who later admitted to not being “scared enough,” nearly gave the family away during the passport inspection. The threat Hitler’s victory posed was real enough: Years later, her mother told her that, on the morning after their victory, the Nazis turned up at the Kerr’s home at 8:00 a.m. to take away their passports. In Zurich, the family was reunited. 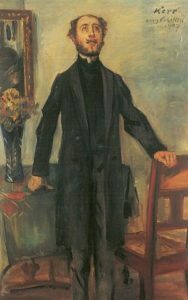 However, the country was not particularly welcoming to Jewish refugees and Alfred struggled to find work at a newspaper. From Switzerland the Kerrs moved to Paris, finally arriving in London in 1936. But even the hoped-for sanctuary of Britain initially proved illusory. The cheap hotel in which the cash-strapped family lived for a time was bombed during the Blitz. Her brother, who was by then studying at Cambridge University, was arrested as an “enemy alien” and interned on the Isle of Wight. None of that, however, shook Kerr’s youthful faith in the country that would become her home. “We got bombed out, it was a hard time, but it wasn’t easy for anybody. I was hugely struck by the generosity and kindness and tolerance of people during the war,” she told the BBC five years ago. “My parents still spoke with a German accent. But there we were in the Blitz, people being killed every night, and nobody ever said anything nasty to them. I couldn’t wait after the war to become British and belong here,” she said. Indeed, Kerr has even been generous in her recollections of her brother’s brief spell in an internment camp. Michael was released, joined the RAF and later became a prominent lawyer and a judge at the Court of Appeal. Unsurprisingly, her parents – who carried suicide pills throughout the war so fearful were they of a German invasion – were more affected by their experiences. Alfred Kerr traveled to Germany just once after the war. It was both a triumphant and tragic return. As he entered a Hamburg theater to see a production of Romeo and Juliet in 1948, he received a standing ovation from the audience. The next morning, he suffered a paralyzing stroke. His wife, Julia, herself an accomplished composer and musician, helped him to commit suicide shortly afterwards. After a stint working for the Red Cross during the war, Judith received a scholarship to study at the Central School of Arts and Crafts and became an artist, decorating children’s nurseries. Two years after a chance meeting at the canteen of the BBC, she married the writer and scriptwriter Nigel Kneale (who was most famous for the science fiction series “The Quatermass Experiment”). The couple had two children: Tacy, an artist, and Matthew, an award-winning novelist. 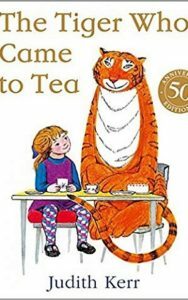 Michael Rosen, the children’s novelist and poet, has argued that “The Tiger Who Came To Tea” has a “whole cloud of meanings” and that, subconsciously, it may reflect the traumas of Kerr’s early life. “Judith knows about dangerous people who come to your house and take people away. She was told as a young child that her father could be grabbed at any moment by either the Gestapo or the SS — he was in great danger,” the former children’s laureate has suggested. “So I don’t know whether Judith did it consciously or not — I wouldn’t want to go there — but the point is he’s a jokey tiger, but he is a tiger,” said Rosen. It is a notion which continues to upset many readers of the book and which Kerr has herself dismissed. “I love Michael Rosen, and he knows I think this is mad. For one thing, I was so lucky: I never saw the Gestapo. I never saw anything bad happening in Germany. Never. Because we left before Hitler took over,” Kerr saidearlier this year. “I think if we’d stayed even a week longer, it would have been very different. So, no. I wasn’t haunted by anything,” she said. The book’s inspiration, Kerr says, is much simpler: a bedtime story she told to her young daughter, which arose from their shared love of visiting the zoo. Later, when her children were at school, Kerr decided to commit the oft-repeated tale to pen and paper. She had been struck, too, by how “boring” her son had found the children’s books which were available at the time. Kerr rejects any notion that her own childhood was anything but happy. “I had a tiny bit of trauma which I didn’t even notice,” she told a children’s online forum. “We had a far more interesting childhood than we would have had otherwise – and our parents were terribly good and made it feel like an adventure. They were terribly sensible,” Kerr said. She notes both Kerr’s dedication in one of her books — to “the one and a half million Jewish children who didn’t have my luck, and all the pictures they might have painted” — and her comments on the BBC’s “Desert Island Discs” in 2004. “I think about them almost every day now, because I have had such a happy and fulfilled life and they’d have given anything to have just a few days of it, and I hope I’ve not wasted any of it,” said Kerr on the Discs. Kerr has also suggested that she finds visiting Germany difficult, notingthat the station she and her brother used when they were going on swimming trips now contains a plaque reminding passengers that it was the point from which Berlin’s Jews were deported to Auschwitz. Aside from the joy she has given, Kerr has also provided an invaluable introduction for many children to darker subjects. Her semi-autobiographical trilogy – “When Hitler Stole Pink Rabbit,” “Bombs on Aunty Dainty,” and “A Small Person Far Away” – spans the family’s flight from the Nazis, through their experiences in wartime London to the first years of her marriage. Told through the eyes of the fictional character, Anna, and her brother, Max, “When Hitler Stole Pink Rabbit” won the German Youth Literature Prize. First published in 1971, it is a set text in Germany primary schools, was dramatized by BBC radio last year, and a film adaptation is reportedly now in production. Its title refers to a toy rabbit — “it was quite old and wasn’t very pink anymore” — which she left behind when the family escaped to Switzerland. “I wanted to describe what it was like – what it was really like – to flee from the Nazis,” Kerr later wrote in an introduction to the trilogy. 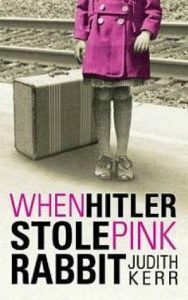 “When Hitler Stole Pink Rabbit” has light moments. As their train passes through southern England on its journey to London, the family is initially confused by the fact that each town and village appears to be called “Bovril” (they had mistaken large boards on the platforms advertising a then-popular, now iconic, British drink for place names). But, as the Independent on Sunday’s former literary editor, Katy Guest, has argued, some of Kerr’s writing is also deeply poignant. “The scene in which big brother Max surmises that Hitler is probably playing with their Snakes and Ladders, and Anna replies, ‘And snuggling my Pink Rabbit!’ must be one of the most heartbreaking in modern literature,” Guest wrote. That assessment received the royal seal of approval in 2012 when Kerr was honored by the Queen for services to children’s literature and Holocaust education. 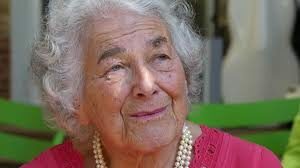 Eighty-five years after she escaped the clutches of the Nazis and half a century after she first told the tale of a friendly tiger’s unexpected visit, Judith Kerr remains Britain’s favorite storyteller.